Designed to make on-the-go bottle feeding even easier, this new formula dispenser holds up to three pre-measured 9-oz. feeds. It converts to a snack storage cup for extended use. Package Contents: Plastic divider keeps the formula separate and ready to mix. • Flip-top spout ensures accuracy and prevents messes when pouring. 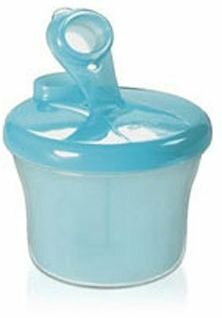 • Can be used as a handy snack cup simply by removing the divider. • All parts are sterilizer and microwave safe.